Enroll now! Registration is open for our spring 2013 online course. The UF Maddie’s® Online Graduate Certificate in Shelter Medicine is currently registering for VME 6812: Shelter Animal Behavior and Welfare. Registration is open to veterinarians and 2nd – 4th year veterinary students world-wide. Registration continues through January 4, 2013. Class begins on Monday, January 7 and continues through April 24, 2013. 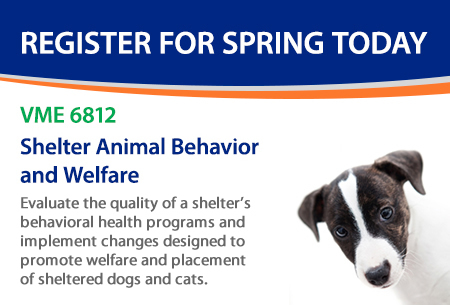 This course will prepare you to evaluate the quality of a shelter’s behavioral health programs and implement changes designed to promote welfare and placement of sheltered dogs and cats. The course explores behavioral assessments, behavioral modification protocols, diagnosis of common behavioral problems, and medical treatments of selected behavioral disorders. Dr. Sheila D’Arpino is the lead instructor for this course. Online courses are convenient because they require no travel and you can complete them at your own pace. However, these are graduate level courses and successful students report spending between six and nine hours per week, per course, on course-related activities. Online courses are also affordable because no matter where you reside, you are charged the current in-state tuition rate for graduate-level courses. In some states, the courses can also count toward veterinary license renewal. 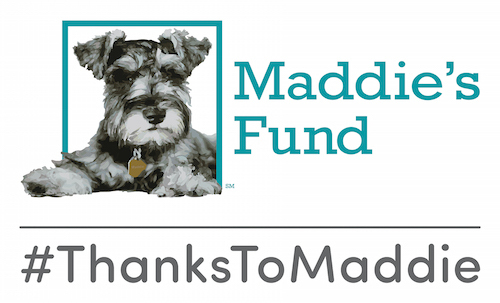 There are three courses in Maddie’s® Online Graduate Certificate in Shelter Medicine; each of which costs $1,614.63 (including tuition and student fees). If any scholarship opportunities become available, we will announce them on our website and Facebook page so check back regularly for updates. If you begin the Online Certificate in Shelter Medicine now, you can complete it by the end of 2013. If you take one course each semester, we recommend you start this spring with VME 6812; continue with VME 6810 in the summer; and finish in the fall of 2013 by taking VME 6811. After completing these three courses (9 credits total), you will earn this one-of-a-kind Maddie’s® Online Graduate Certificate in Shelter Medicine from the University of Florida College of Veterinary Medicine. If you are a new student, the registration process takes approximately two weeks. To begin the registration process, please visit our Application and Registration webpage for step-by-step instructions. You will also find answers to Frequently Asked Questions. For additional information, please contact us. You can also call Online Student Support at 352-294-4757. We hope you’ll join us to learn more about Shelter Medicine.